A longer than usual drive for the first of the Bank Holiday weekends saw the club at Aultguish, an Inn and bunkhouse that really does stand alone in the middle of nowhere between Garve and Ullapool. Despite leaving pretty sharp after work on Friday by the time I arrived almost everybody else was ensconced in the lounge with plans being made for the next day. By this time those that had arrived had already started a fridge war with the other group staying at the hostel, as President it made me quite proud. Marcus took great joy in telling me I was in the snorers room just as I was heading off to bed and wished me luck in getting to sleep, not long after this however he appeared rather sheepishly at the door of the room I was in asking if there was a spare bed. In an apparent misunderstanding Becs had inadvertently taken the bed that Marcus had laid claim to in the next room not realising that the bed was already taken, or so she claims, believe what you will! (I should probably add Marcus wasn’t in the bed at the time Becs made this “honest” mistake!). I was quite surprised the next morning to find sun streaming in through the window, this wasn’t forecast, although one thing the forecasters did get right was the wind and as predicted walking was indeed arduous and in some cases nigh on impossible. A group comprising Alison, Chris, Becs and Marcus (yes they were still speaking to each other) headed into the Fannichs to see how many summits they could get round and after coming off Clach Geala were optimistic of getting round to Sgurr Mor and Beinn Liath Mhor Fannaich, on the ascent to Meall a Chrasaigdh however this all changed as they were literally blown over by the wind and crawling became the best means of forward movement. Plans for Sgurr Mor at this stage were shelved and a retreat to the car ensued. Both Kenny and David were on Wyvis, Pauline and Dave cycled in to Loch Fannich (not literally as that would be quite wet) and climbed the two most easterly Fannichs, Harsh, Kate, Allan and Fiona walked in from Black Bridge to climb Beinn a Chasteil where they received route advice from the very helpful laird and Emma and I went on a northerly road trip to Ben Klibreck. We all returned to the bunkhouse rosy cheeked from the wind and continued our fridgegate wars with the other group in the bunkhouse……………. The next day was less windy but low cloud and drizzle was much in evidence in the morning. There was a lot of prevaricating about what to do, well in my case at least, Dave and Pauline decided to head to Orkney for the rest of their week off while Kate decided further east was best and so headed off to the Corbett Bac an Eich (not that she is bagging Corbetts you understand, absolutely not) with Allan, David, Fiona and Harsh, a day on a Corbett, that’ll be nice and relaxing. As they straggled and hobbled in later behind Kate, who still looked fresh as a daisy, relaxing wasn’t the word that was on the tip of their tongues, mumbling something about an alternative route, steep pathless ground and where`s my dinner! Chris, Becs and Emma headed back to the Fannichs to do the munros from An Coilechean to Beinn Liath Mor Fannich where it cleared on the way up to Sgurr Mor and they had a fine end to the day. 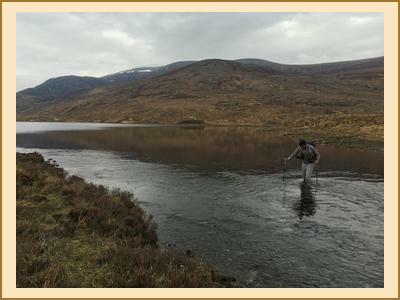 Kenny and Alison cycled to the south side of Loch Fannich and climbed An Cabar which is a Hugh?, a Hump? I’ve no idea but its about 500m and looked a good choice for the day. I did a wee bike ride and run up a very boggy Graham and Marcus went bouldering near Black Bridge before he met up with myself Kenny and Alison for coffee and cake at the Inchbae Hotel, it was a tough day for us. Fridgegate was still in full swing back at the bunkhouse although hostilities by this time had thawed a little, some folk even spoke to the other group but to be honest this didn’t really catch on. The final day was a repeat of the Sunday weather, low cloud and a bit dreich. Kate and Allan were heading off to Oban for a trip to Colonsay and Islay and Jura for the rest of the week, despite knowing he was going to be away all week Allan had only brought one pair of trousers with him so a trip to the finest tailors in Oban was on the cards prior to boarding the ferry to Colonsay. 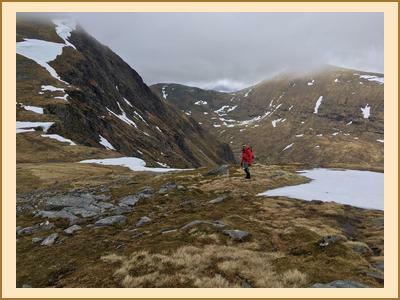 Alison went 2nd munro ticking on Beinn Dearg and Cona Meall, tricky navigation in the thick mist, I went 2nd munro ticking too in the eastern Fannichs, tricky navigation at times also and Chris and Harsh went up the “never a dull hill” Martin route on Am Faochagach. Becs went home to her own bed…….. If you happen to be going on holiday for a week in the Scottish Islands take more than one pair of trousers with you. As a footnote Allan did secure a new pair of trousers in Oban, the ferry to Colonsay was however cancelled due to the wind, you can’t win them all.